Last Friday I finally played my first battle of Warhammer Fantasy Battle with fully painted army. It was only 1200 point Skaven Army, but still. It was first time in my life, I was able to do that with every miniature included in army rooster (well, not entirely true, but about this – later). It took me over one year to accomplish that. I was taking my painting station and miniatures to such countries like – Sri Lanka, Malaysia, Thailand, Indonesia, Philippines, Mexico, El Salvador, Costa Rica and Nicaragua (and few more:). There were months I didn’t feel like painting at all, and on the other hand – there were also I was painting like crazy. Last week for example, before this battle I had 12 Clanrats left to complete whole regiment. That was demanding task – very little sleep, no social or family life – and I made it! Whole army completed:). I’m happy as never before (well…let’s say concerning my hobby, not entire life;). Usually my pace of painting is much, much slower. I need about 3-4 days to finish 3 ordinary Skaven, and I need to sit and paint about 3-4 hours a day, focused on the work – and believe me is hard to focus, when it’s all about Skavens only. You got bored easily – some diversification is needed ( like for example this nice mini from Wolsung – Sir Zachary Fiercebatten III) to keep morale high. Anyway – almost year and a half – that long I was painting three regiments of rats, Doomwheel, and few characters, and now I’m here, at this point – ready to play Warhammer (just before 9th edition – what a bad timing from me:). Grey Seer Model from End Times. Super awesome! I chose Grey Seer for the general because of quite obvious reason. Magic in general and of course Dreaded Thirteen Spell. For 1200 points, not everyone spend some to deploy 4th level wizard on the battlefield, but remember that – Grey Seers are faithful agents of Council of Thirteen. 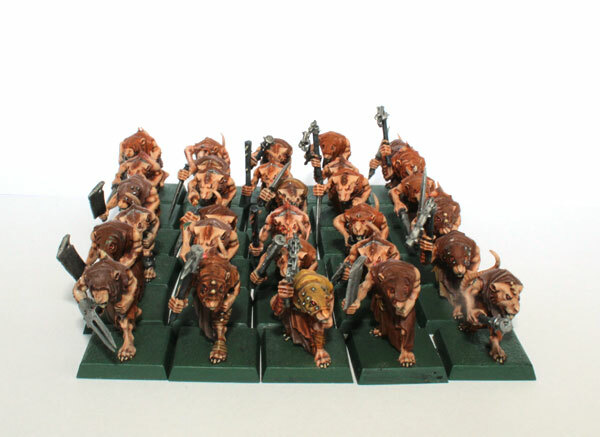 They are essential for any Skaven army – even these small like mine. And besides – opponents are often surprised, that my choice is Grey Seer. After all he costs 240 points, nothing left for any good fighter. …but think about Skaven Magic – with little luck, it’s possible to demolish opponent with spells, or even transform more of his/her units into Skavens. In my opinion – it’s totally worth to sacrifice fighter and choose Grey Seer. 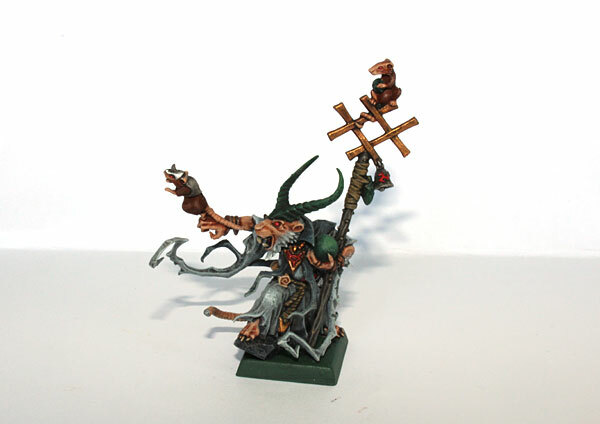 As for the model – this is End Times Grey Seer – I love that miniature. I painted him when I was in Mexico – more pics here. 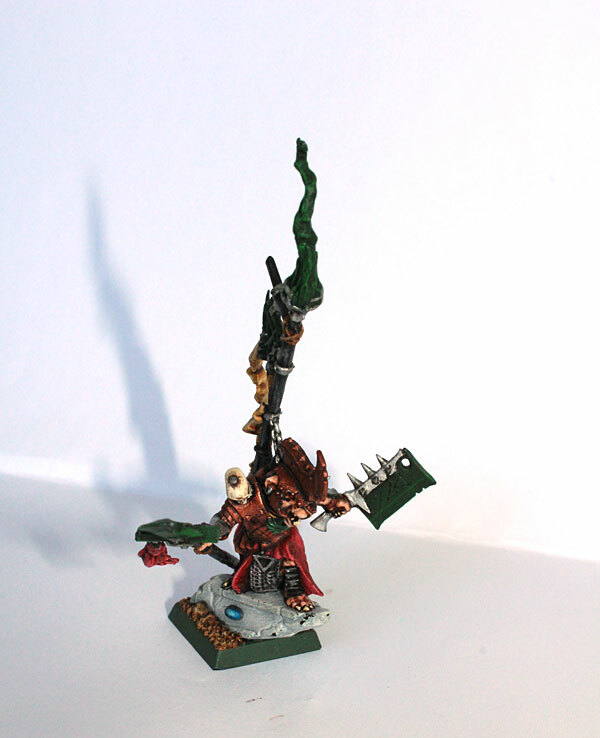 Warlord from Island of Blood acting as Battle Standard Bearer. I don’t have any proper model to represent my Army Banner at the moment. I’m looking for limited edition metal miniature from 6th edition, but first of all I don’t like the sculpt that much of that mini and second thing – I don’t want to pay to excessive price for it. Ebay prices for him sometimes are crazy. I just wait, or think about some other option. Meanwhile this miniature of Warlord from Island of Blood will be my Battle Standard Bearer. He has some banner on the back – maybe no that fancy, but sufficient:). This was the very first miniature I painted for the army – it was October 2013. Long, long time ago. Old metal model from 6th edition. Many crappy models were released back then – but this one is actually one of the best (personally I love little tiny rat reloading the pistol:). I painted him in November 2014 in Mexico City. All, but 4 are metal miniatures from 4/5th edition of Warhammer Fantasy Battle. Remaining four are from 6th edition. There’re together 23 of them (so far). 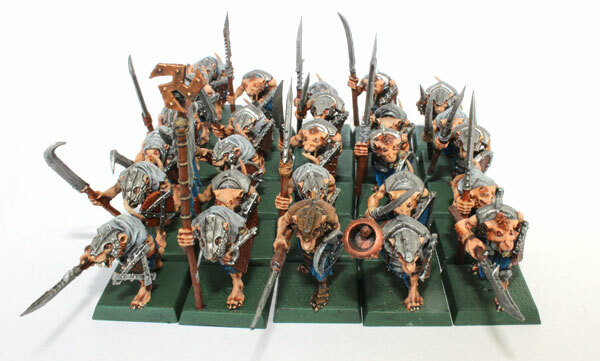 I plan to have regiment of 30, but for need of the battle I played I needed only 23 – I was way too busy with painting remaining Clanrats to bother to finish last seven. 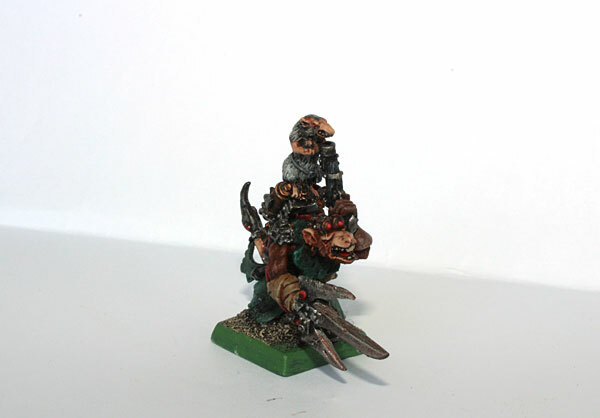 And this is my another fluffy choice for the army – whatever you might think about usefulness of Stormvermin in the battle – I love them, and I think they will be included probably in every battle I’ll play. Stormvermin are the must. Elite. Period. I started to paint first batch of the unit – command group and bunch of 5 more, during my trip to South East Asia in 2013/14, and I finish them in March 2015 in Baja California, Mexico. That was long run, I must say. Soon, after small break from Skaven, I’ll finish them any time soon and run into full 30 models in regiment. My nightmare. I promised myself not to touch any Clanrat in near future. I fed up with Clanrats, and I had no intention to do so. At least those plastic ones. On the other hand I have big plastic bag of old 80/90s metal models. Those could be fun:). I needed regiment of 29 Clanrats with spears and shield for my first battle. I was painting them to very last moment. I finished the last detail about 1 hour before I needed to leave my flat. I was happy. It’s the final touch of the brush, no more Clanrats. Never again. At least I thought so. Imagine my surprise, when I counted them before I put them to the box – there were only 27 of them! Two were missing (three to be exact – but I needed two)! I had no freaking idea where I could put them, and I had no time to look for them. Little confused I left my house without two missing Skavens and I just agree with my opponent that first two killed in action, will be those treacherous deserters. I found them later same day in the big box. Unpainted. I just miscalculated the number of them on the shelf – I was pretty sure there are 30 of them. I was wrong. Missing three were deeply hidden among some Skinks and Sauruses. And, what’s the worst part – I need to paint three more Clanrats soon. Aagrh! Obvious choice:). I needed 3 boxes to complete my regiments of 30 Clanrats and 30 Skaven Slaves. Lots of painting – I started in February 2014 and ended…well… last Friday:) Finally. No Slaves were missing, so I could rest from them for a while. I’m not a big fun of deploying Slaves. I know if you that, you need huge regiment – something like 50 plus to swarm the enemy with cannon fodder. My tiny 30 rat strong units is way too small for the battle, but for me regiments of 30 Skavens are big enough. This is my inner limitation I won’t exceed. 30 is enough. I don’t play competitive battles any more, and for casual gaming it’s just fine. Warpfire Thrower model from Island of Blood campaign. At the moment I have 2 Warpfire Throwers, one Ratling Gun and one Poisoned Wind Mortar. For the first battle I chose Warpfire Thrower (plastic model from Island of Blood) to company Stormvermin unit and Ratling Gun along with Clanrats. Oh, how I love Weapon Teams! They are not doing any good on the battlefield.At least in my case. Almost every time they are killed in one of the first turns or they simply misfiring. Tough Skaven life! Logic suggests I shouldn’t’ take any Weapon Team for the battle, but logic is not domain of Skaven Army. Weapon Teams are just too Skavenish and fluffy – I can’t resist to have them, and I’ll continue to choose them until they prove to be useful (someday, hopefully). And my favourite model – Doomwheel! 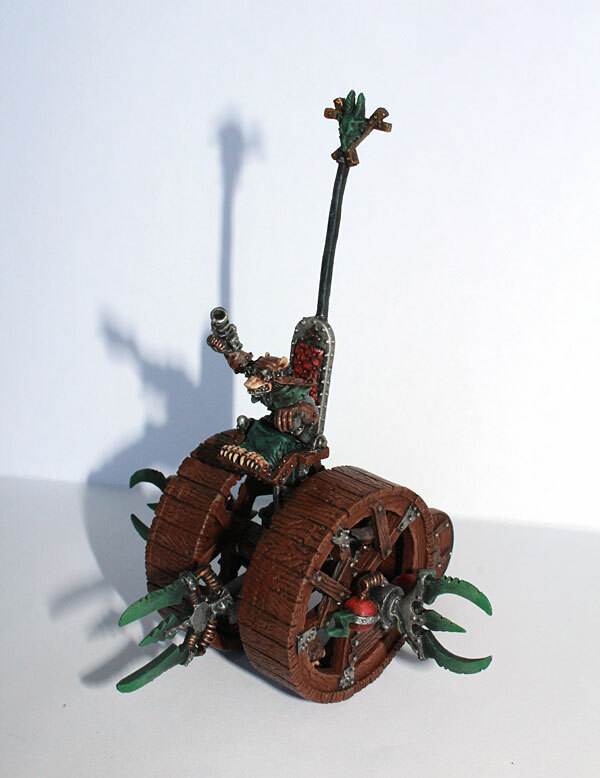 This the best part of collecting Skaven Army – Dooomwheel model and its rules. Unpredictable and chaotic, but dangerous and destructive. Fun, fun, fun – pure Skaven fun. You’ll never know what happen with Doomwheel. Randomness is in it’s nature. And you have to learn to love it or leave Skaven army – it’s not for you if you look for steady and predictable rules. In my opinion – Doomwheel, just like Grey Seer, is essential. 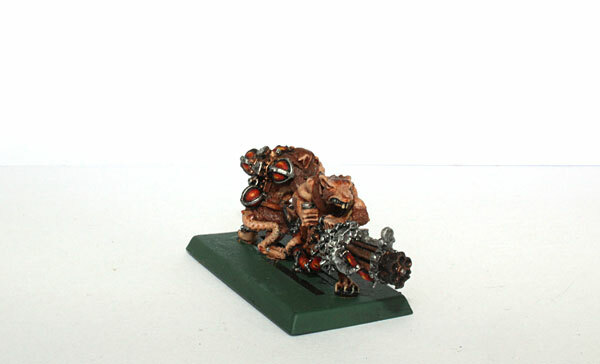 There’s no good Skaven army without Doomwheel. Not choosing Dooomwheel is like heresy. Against Council of Thirteen and brilliance of Clan Skryre. This is old metal model from 1990s ( I think) – I painted it in September 2014. I remember I was trying to finish it just before we left to Mexico. I made it – all is left is to paint the banner for it and put it on some nice base. Allright. 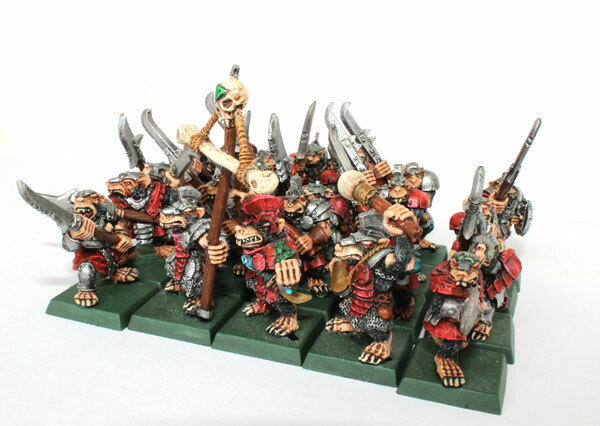 That’s it – they are my Skaven army. My first entirely painted army. I’m collecting miniatures for over 20 years, and now I achieve for the first timne something like that – wow I’m really proud of myself! They are painted, but as you can see – they are not 100% finished. 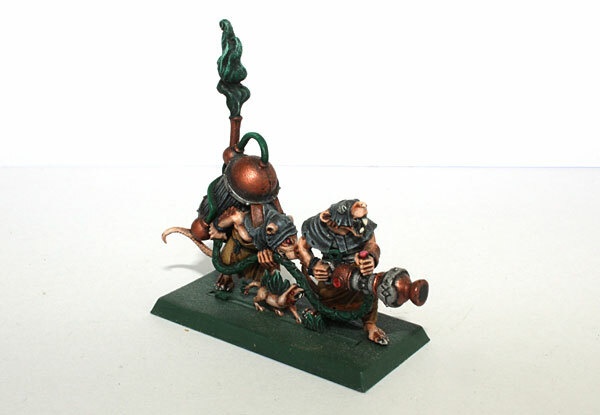 I need to paint and attach banners for Stormvermin unit and for Doomwheel. I also need to do some freehand design for banner of Clanrats. I will do it in upcoming months for sure.I was hoping to made them before the Friday battle, but I thought if I take care of standards, I wouldn’t make it with finishing miniatures. I was right. So, banners later:). Another thing – bases. I already have the idea for Skaven bases. I have written the post about it few months ago. Wyrdstone Mines resin bases from Fantascape are already ordered few weeks ago, and I patiently wait for them to arrive and start Operation Rebasing. They are square bases:) I don’t believe in rumours of 9th edition round bases. At the moment I write the post, I’m after my first battle against…Skavens. In few days I’ll post small Battle Report, and you’ll see how it all went. And right after that – I’m off for three weeks to wander around Czech, Germany and Netherlands. So, probably there won’t be any updates here for some time. Cheers! Great work. I like the stories behind many of the units as well. I’m still working on finishing a few of my armies, but constant work has gotten me to the point where I can field very little unfinished on the field of battle. (Or all finished for the smaller games – if only I had time to play!). I congratulate you on your achievement! Will the lizards be the next army? Fantastic painting GoT. Love the Doomwheel! The detail on your Grey Seer is awesome. Congrats on finishing your army. You say you’re no pro-painter but I see a fair amount of skill, technique and brush control in your work! Great job mate. Nice and varied army! Congratulations, Skaven are not easy to ever finish, so many models! oh yes, way too many:) thanks!